An Easy-to-use counting scale that offers a simple, neat keyboard, weigh, sample, count, accumulate, and print function. Capacities: 10 lb. to 100 lb. Weight: 20 – 25 lbs. A unique multi-tasking counting scale built for tough industrial use or for the most delicate parts counting. Stainless steel enclosure and platform allow for easy clean-up and maintenance. 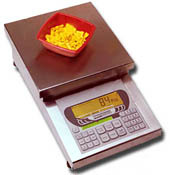 It is a super-high accuracy counting scale, a laboratory scale with a minimum capacity of 5000 grams by .05 grams, a checkweigher with under/target/over bar graph display, a bench scale for high resolution weighing, and it is able to accept an additional optional remote platform.